There are many mindfulness techniques. You can not compare what exercise is the best and which ones are not that effective. It all depends on each individual. What may be good for me, may not work for you. I started with adult coloring books. Initially I found it great but slowly it became a bit boring and soon I lost interest. It was okay but I wanted something more interesting and creative. Then I began to sketch my own art and boom! it clicked for me and I loved the whole exercise. Turn on any soothing music and start your sketch with slow and steady pencil strokes. After sometimes, your pencil strokes start resonating with music in a positive way. And never hurry up in order to complete your sketch fast. Instead do it slow and complete it in 2-3 sittings. Music selection plays a great part in your mindfulness meditation (Yes, I call this process of sketching for mindfulness as meditation). However, It again depends on your liking and disliking. There are certain types of music which improves the coherence of your brain. For me, Raga Malhar works best for me. In Indian Vedic music, various Ragas are suitable for a particular time of the day, e.g. if Raga Bhairvi is supposed to be sung or listened in the morning during sun rise, it will loose its effectiveness in the evening. That is why I have selected Raga Malhar which is effective through out the day. These Ragas not only help your act of sketching resonate with the energy of music but they uplift the overall positive energy of the environment. The artwork below is my first effort to do mindfulness exercise. 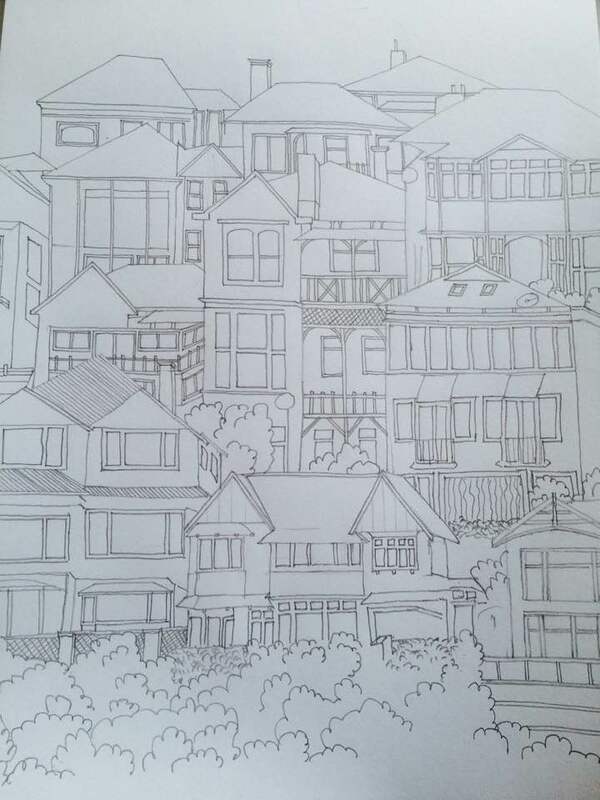 This sketch shows a very famous street of Wellington known as Tinakori Street. And believe me guys, I am not an artist by profession. If I can do it, anybody can do it.